Does it have to be difficult to write your resume? No, it doesn't if you use a template that was designed to be easy to complete. The difficult parts like formatting, optimizing and design have all been done. You just need to insert your personal details into it. From there our program will take over and put all your raw data together to produce a professional, high quality resume. The same applies to your cover letter, reference page, etc. If you know how to use our resume creator, which is where you get this template, then you know how to use all our creators because they are all based on the same system. Our system was specifically designed to be easy for you to understand and navigate. With a picture on the right side this template really stands out, your name, etc. are on the left. The section titles are capitalized with an underline below the titles only not across the whole page. Like our other templates all the colors, arranging, selections, sorting and fonts are promptly selected by you. Choose the features you want, skip the ones you don't. Fine-tune and tweak it until it is just the way you want it. Cost isn't a concern there has never been one since 2011! 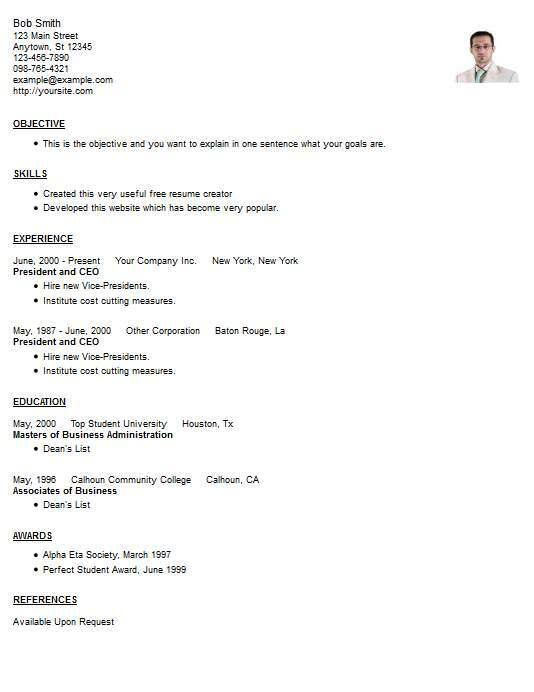 Not only is this resume template easy to write it is also easy on the wallet, it is completely free. That is yet another reason Resume4Free is so popular with job seekers. Please peruse our support area for help with writing and improving your pages to make them more effective.